A 100 m high gravity dam (Castrovido dam, Burgos, Spain) is founded on a soft Weald red claystone with inter-bedded sandstone strata. Claystone weathering was identified in vertical and horizontal profiles of water content and dry density. 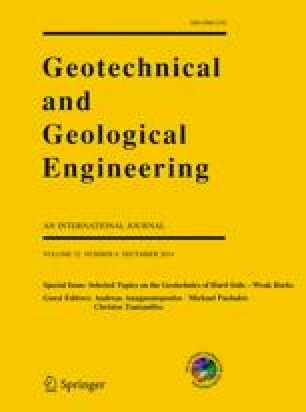 Peak and residual strength of rock matrix is given in the paper. Clay and sandstone layers dip 15°–20° in the upstream direction. Dam stability is essentially controlled by the available shear strength at the sedimentation planes. Block samples were recovered for each of the contact types mentioned. They were tested in high capacity shear box machine (30 × 30 cm). In addition, large scale shear tests (80 × 80 cm) were performed in situ. The roughness of the sheared plane was determined after each one of the tests. Additional information includes some direct shear tests on joints recovered in borings and the results of residual strength tests performed on clay fillings on a ring shear apparatus. The results of all the tests performed are compared in the paper showing the effect of shearing surface roughness. In general, strength envelopes determined “in situ” exhibit a marked nonlinearity at the low range of confining stresses (0–0.2 MPa). Laboratory tests on smaller specimens show linear Mohr–Coulomb envelopes. Existing relationships between joint roughness and strength envelopes were also included in the comparison. The paper discusses the procedure followed to select an appropriate strength envelope for design purposes on the basis of all the available information. The case points out the difficulty to select unambiguously a suitable design strength for the critical sedimentation surfaces despite the efforts displayed in the field and in the laboratory. *Previously published in Anagnostopoulos et al. (2011). Reprinted—Published in revised form with kind permission of IOS Press. The authors acknowledge with thanks the support and help received from: the Ministry of Public Works of Spain, the general dam contractor (FCC) and “In Situ Testing”, the company in charge of performing the large scale field shearing tests. The support provided by the SAFELAND project financed by the European Community (7th Framework Program) and by the BIG RISK project financed by the Spanish Ministry of Science and Innovation is also acknowledged.